Who’s ready to paint a piano?! I’m guessing if you stumbled upon this post it’s because you are. And I’m guessing you’re also a little nervous, right? I mean, its a huge project, is it not? Not to mention a somewhat controversial one. It’s okay, admit your fears. This is a safe place. You see, I was once like you. But then I painted my piano from start to finish in two hours with a new paint I had never used before. And I didn’t stick with a neutral, no no. I painted it blue. And it turned out amazing. Come in grasshopper, and let me teach you the ways of piano painting. There are lots of good step-by-step “how to paint a piano” tutorials out there on the web. And I kind of ignored all of them when I painted my piano. A good tutorial tells you to wash, sand, tape off, paint, wait, paint, wait, seal. They might even have you disassembling parts of your piano. I even read one that said to take out the keys. Holy insanity, Batman! And then there are the naysayers. The people who, when you tell them you are considering painting your piano, look at you like you just suggested sawing off your own leg. They’ll huff and fume about common decency and the value of good wood. “You just can’t do that to a piano,” they’ll tell you. Here’s the number one tool you need when you decide to paint a piano: Fearlessness. Yup, that’s it. A piano is a beautiful statement piece that can make beautiful music and bring joy to your family. 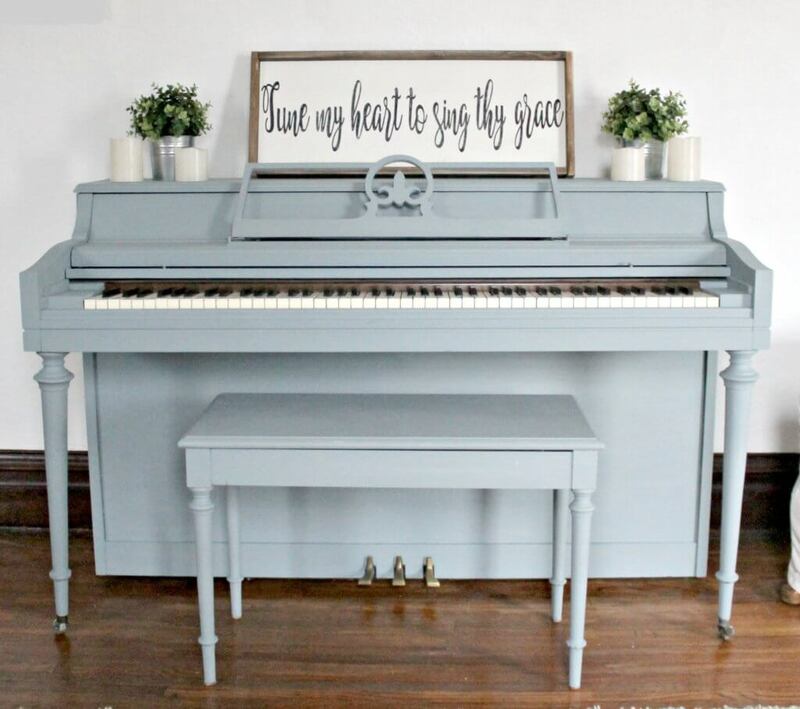 So, if its your piano in your home and the wood look just isn’t doing it for you, paint it. I’m guessing you brought the piano into your house for enjoyment of some kind, so if something about it isn’t enjoyable, fix it! I can personally attest that you will not be struck by lightning or burst into flames. What you will get is a lovely focal piece that people are drawn to and that you love. 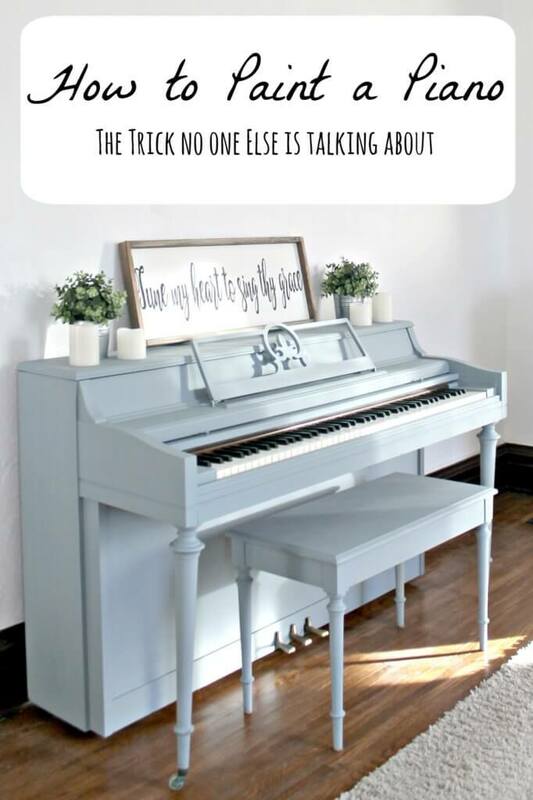 So for the lowdown–what do you really need to do to prep a piano for painting? All you need is some paint, a brush, some painter’s tape, a drop cloth, and some time. I gave my piano a quick clean off with a damp rag. Then, I taped off around the keys and the pedal. Then I started painting. Seriously. I used Miss Mustard Seed Milk Paint in the color Bergere. I had never used the paint before, and really didn’t even practice with it before I started painting. Since my piano was lacquered and I didn’t want a super chippy finish, I used her Bonding Agent so the paint would not flake off. I could not be happier with the results and have ordered many more shades of her milk paint. It is amazing and I don’t know why I waited so long to try it! Honestly, just take your time getting all the detail work. I spent probably 45 minutes per coat, and did two coats total. It was not bad at all. I know it seems like a huge undertaking, but I was super impressed with how easy piano painting can be. By the way, don’t you guys just love the wooden sign on top of the piano?! 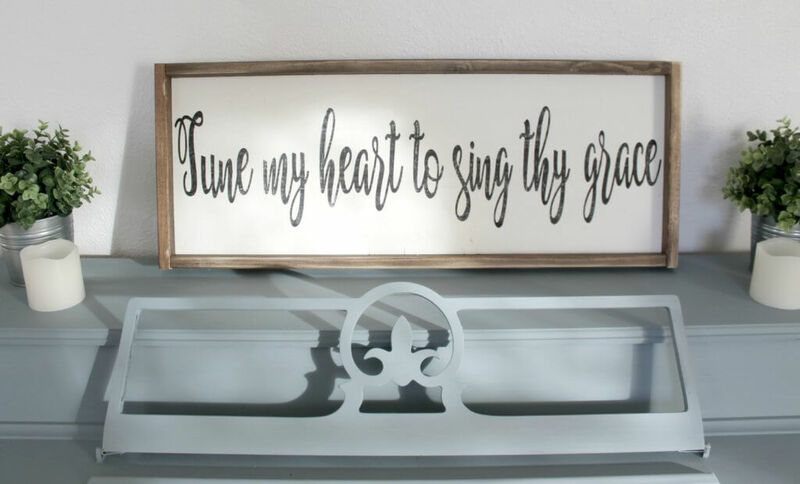 It’s a line from the hymn “Come Thou Fount.” This was my grandma’s favorite hymn, and since she was my piano teacher, I thought it would be the perfect piece to hang over my piano. The sign is a custom piece made by Stephanie from Simply Lovely Lumber. Through January, you can get 15% off your order in her shop by using code FREINDSANDFAMILY. Now seriously, guys. Go on and paint your piano, if that’s what you want to do. Be fearless and don’t worry about making a mistake. I promise it isn’t nearly as hard as you might think! I love the need for fearlessness! Cute! I painted mine too and my only regret was not doing it sooner! I also did no prep work beyond cleaning it off! I ended up using chalk paint. I love painted pianos! (Oh and I blogged about it too and the fact that people–me included—are scared to do this! Thanks for sharing! So true!! Who would have thought?! Did you add the “bond” to the paint? Did you put the bonding agent on before or after you painted with the milk paint? Actually, the bonding agent is mixed directly into the paint. You can find instructions on miss mustard seed paint’s website!!! How much paint do you use for paint the piano? A quarter of galón 1/2 galón or 1 galón? I believe it equaled out to a half of the quart bag!! IF you use the special bonding agent with the milk paint, you should not need to sand! I did no sanding and it adhered great! I’m sorry but not prepping furniture before painting is lazy. I own a furniture business and I would never understand any circumstances not prep my surface. Silly question but what type of piano is yours? We are in the market for one but I want the smallest and simplest one possible. Is it a spinet? Two years later, how has it held up? It has held up great! We have been pretty easy on it, but it survived a toddler! Did you use a special brush for this? No special brush needed! I always prefer to buy high quality brushes, since they do work better, but any old brush will do! Did you use painters tape to protect the keys? Yes! Keys, pedals, anything you need to protect! Worked great! Your piano turned put absolutely beautiful! Have you used any other brand other than Miss Mustard Seed? Thank you heather! As far as milk paint goes, I’ve only ever used Miss Mustard Seed!